The SaeboFlex helps me strengthen my fingers, improve my grasp and release, and actually helps me reach up taller! An effective and engaging home therapy program is CRITICAL for a successful recovery. 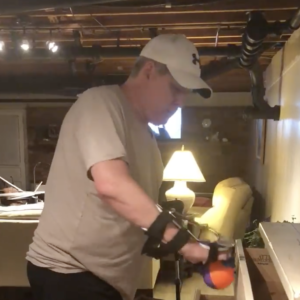 Check out Neal’s creative home exercise using the SaeboFlex! “Homemade creative Occupational therapy using a Saebo device (my fun Edward Scissorhands-looking device). This helps with hand grasp, release, reach.